At least three people died Saturday when a vehicle ploughed into busy cafe and restaurant terraces in the German city of Muenster before the driver shot himself dead. Images on social media showed smashed and upturned tables and chairs strewn accross the pavement outside an eaterie in the centre of the picturesque medieval city. A police spokeswoman in the western city, Vanessa Arlt, told AFP that the driver of the vehicle “shot himself”. “The perpetrator drove into several cafe and restaurant terraces in a major square in the centre of Muenster,” Arlt added. Police spokesman, Andreas Bode, said it was “too soon” to call the incident a deliberate attack. According to the online edition of the Spiegel magazine, German authorities were “assuming” the incident was an attack, though there was no immediate official confirmation of a motive. “Terrible news from Muenster,” German government spokeswoman Ulrike Demmer said in a tweet, saying local police were providing regular updates. Images broadcast by German television showed police and firefighting vehicles clustered around a street in the centre of the city of 300,000 people. Armed police were deployed and officers urged residents to avoid the city centre to allow investigators to get to work. Germany had long warned of the threat of more violence ahead after several attacks claimed by the Islamic State jihadist group, the bloodiest of which was a truck rampage through a Berlin Christmas market in December 2016 that left 12 people dead. 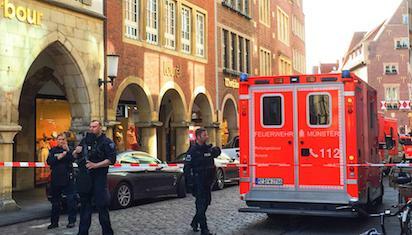 German prosecutors said the man likely had a “radical Islamist” motive. And at the end of October, German police arrested a 19-year-old Syrian identified only as Yamen A. suspected of planning a “serious bomb attack” using powerful explosives. German troops in the anti-IS coalition do not participate in combat operations but support it through reconnaissance, refuelling and training. Germany’s security services estimate there are around 10,000 Islamic radicals in Germany, some 1,600 of whom are suspected of being capable of using violence. Chancellor Angela Merkel has allowed in more than one million asylum seekers in the past two years — a decision that has driven the rise of the far-right Alternative for Germany (AfD) party, which charges that the influx spells a heightened security risk. IS also claimed several similar attacks in Europe, including a rampage along Barcelona’s Las Ramblas boulevard in August 2017 that killed 14 and left more than 100 injured. The deadliest such incident in recent years was in the French resort city of Nice in 2016, where a man rammed a truck into a crowd on France’s national July 14 holiday, killing 86 people. The post At least 3 dead after vehicle smashes into diners in Germany appeared first on Vanguard News. Why it must be Buhar/Osinbajo this Saturday!